Because it's convenient when you're on the go, beef jerky makes an excellent between-meal snack, and it may even help you shed extra pounds. Jerky is known for being high in sodium, but not all varieties of beef jerky are sodium-rich. Choosing healthier types of jerky may help you reap several benefits, including weight loss. Can Beef Jerky Help Weight Loss? If you're choosing lean, lower-calorie varieties of beef jerky in place of higher-calorie alternatives like sweets, you can lose weight eating beef jerky. Some types of lean, reduced-sodium beef jerky varieties provide 14 grams of protein and just 70 calories per ounce. The high protein content of beef jerky causes you to feel full for longer periods of time, helps maintain lean muscle mass, keeps your body's metabolism high -- even during periods of weight loss -- and can help treat obesity, according to a 2012 review published in the British Journal of Nutrition. Replacing sweets with lean, reduced-sodium beef jerky is often an effective strategy for lowering your overall calorie intake. For example, while a 1-ounce portion of beef jerky may provide just 70 calories plus satiety-boosting protein, a regular-sized candy bar often contains over 200 calories but much less protein. However, if you add beef jerky to your meal plan but don't eliminate sweets or other high-calorie treats, weight loss could be a challenge. 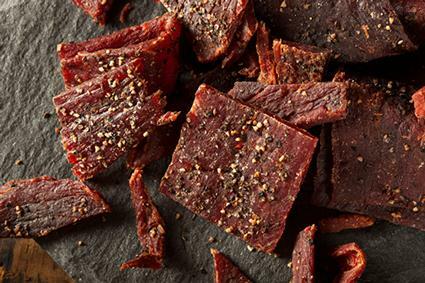 Because beef jerky helps boost satiety, this protein-rich food can help you stick within your daily weight-loss calorie allotment. If you're overweight, aim to consume about 500 fewer calories than you expend each day to achieve a weight loss of 1 pound weekly. The National Heart, Lung, and Blood Institute suggests that eating plans containing 1,200 to 1,500 calories often help women lose weight, and plans providing 1,500 to 1,800 calories can help men and active women shed pounds. While reduced-sodium types of beef jerky may provide just 100 to 200 milligrams of sodium per serving, regular beef jerky can contain over 500 milligrams of sodium per ounce. The American Heart Association suggests Americans limit sodium intake to 1,500 milligrams daily, unless they lose large amounts of sodium by sweating, to keep heart disease risks low. Therefore, always check the nutrition facts label to determine how much sodium is in your beef jerky. Or, try making your own homemade jerky -- but go easy on high-sodium ingredients, such as soy sauce. The U.S. Food and Drug Administration reports that 120 milligrams of sodium (or less) per serving is considered low, but 480 milligrams of sodium or more in a serving is high. Replacing higher-calorie snacks, like sweets, with lean, low-sodium beef jerky can be an effective weight-loss strategy, but only if you're burning off more calories than you're eating daily. Because it's rich in protein, beef jerky helps fill you up, making it easier to curb sweet cravings and control your overall calorie intake.